Industry experts weigh in on the upcoming policy and payment changes outlined in Medicare’s Final Rule for 2013. 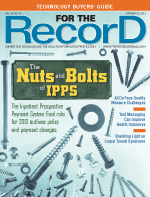 Initial industry reaction to the final rule updating Medicare’s payment policies and rates under the Inpatient Prospective Payment System (IPPS) for fiscal year 2013 suggests that the detail was fairly predictable. The rule, which was released in August, is designed to promote accurate payment of inpatient services, strengthen the hospital inpatient quality reporting program, finalize new policies for the hospital value-based purchasing program, and enact a framework for two new quality reporting programs that will apply to PPS-exempt cancer and psychiatric hospitals paid under the inpatient psychiatric facilities PPS. For the most part, it has met those goals, says Judy Sturgeon, CCS, CCDS, clinical coding/reimbursement compliance manager at Harris County Hospital District in Houston, who points out a few notable details that will impact HIM. “The codes aren’t a big deal, but there’s a new hospital-acquired condition [HAC] that does raise significant issues for both correct coding and correct reporting,” she says. According to the CMS, the new rule will increase the overall payment rate to general acute care hospitals by 2.8% and operating payments by 2.3% in fiscal year 2013. These figures represent a projected total Medicare spending increase of $2 billion on inpatient hospital services compared with 2012. While one new procedure code was added to the ICD-9-CM Volume 3 code set for fiscal year 2013, there were no new Medicare severity diagnosis-related group (MS-DRG) or diagnosis codes included in the final rule. While not included in the IPPS proposed rule issued in March, procedure code 00.95, Injection or infusion of glucarpidase, was added to reflect the administration of glucarpidase (Varaxaze) to treat cancer patients with toxic levels of methotrexate in their blood due to impaired renal function. Because it is a new technology, the CMS determined that the procedure was not affected by the partial code freeze and assigned a new code to capture it under 00.9, Other procedures and interventions. Although no new diagnosis or MS-DRG codes were added, Libman notes there are some significant changes to the list of complications and comorbidities (CCs) and major CCs (MCCs). Specifically, the CMS changed the classifications of some malnutrition codes to better reflect and capture severity. Previously, codes 263.0, Moderate malnutrition, and 263.1, Mild malnutrition, were subcategories without a CC or MCC designation. Diagnosis code 584.8, Acute kidney failure with other specified pathological lesion in kidney, received a downgrade for 2013 from an MCC to a CC. • Surgical site infection following cardiac implantable electronic device, which will be identified by diagnosis codes 996.61 or 998.59, combined with any of the following procedure codes: 00.50 to 00.54, 37.80 to 37.83, 37.85 to 37.87, 37.94, 37.96, 37.98, 37.74 to 37.77, 37.79, or 37.89. • Iatrogenic pneumothorax with venous catheterization, which is identified by diagnosis code 512.1, is reported with code 38.93, Venous catheter. Sturgeon offers the following examples to illustrate her point. In the first, a patient has a pleural biopsy and a subsequent iatrogenic pneumothorax. He also had a venous catheter placed for infusion of therapeutic IV medication, but the biopsy, not the catheter, caused the pneumothorax. In this case, she says the pneumothorax would be incorrectly reported as an HAC due to the venous catheter. • A patient has a central venous catheter placed by radiological guidance into the subclavian vein and develops an iatrogenic pneumothorax from the process. The code for this venous catheter is 38.97, not 38.93. • A subclavian totally implanted vascular access catheter and device is placed in the patient, who develops an iatrogenic pneumothorax as a result. The code for this venous catheter is 86.07, not 38.93. In these two examples, the pneumothorax would not be reported even though it is an HAC in both instances. For these conditions, as well as others already listed on the HAC list, inpatient facilities will not receive higher MS-DRG payments. In the final rule, the CMS projects total savings from all HACs will be $24 million in fiscal year 2013. In addition to the new HACs, specificity also was added to the existing vascular catheter-associated infection HAC category through the additions of 999.32, Bloodstream infection due to central catheter, and 999.33, Local infection due to central venous catheter. Sturgeon adds that examples of these new codes could include bacteremia or sepsis due to the central venous catheter for 999.32 and cellulitis or an abscess at the site due to the central venous catheter for 999.33. According to Libman, a positive change was made to the grouping logic of principal diagnosis code 487.0, Influenza with pneumonia, from a set of simple pneumonia MS-DRGs to a group that represents a more severe form of the condition. Based on requests and comments, these classifications were moved from 193, 194, and 195 to the higher-level MS-DRGs 177, 178, and 179. “That was a reasonable proposal and CMS quickly agreed,” he says. An update to the fiscal year 2014 program requirements also was included, reducing the annual random sample from 800 hospitals to 400 due to the fact that 99% of sampled hospitals reported accurate data in the most recent year. Sturgeon believes there is nothing in the final rule regarding quality reporting that is expected to critically impact coding. While that may be the case, she emphasizes that, in a general sense, quality reporting programs do have a significant effect on productivity due to an increase in information requests. Numerous policies related to value-based purchasing were outlined in the final rule with the aim of “better health care, better health in the entire population and lower costs through improvement,” according to the CMS. • the institution of value-based incentive payments beginning this January with respect to discharges occurring during the fiscal year. • domain weighting for hospital performance scores.